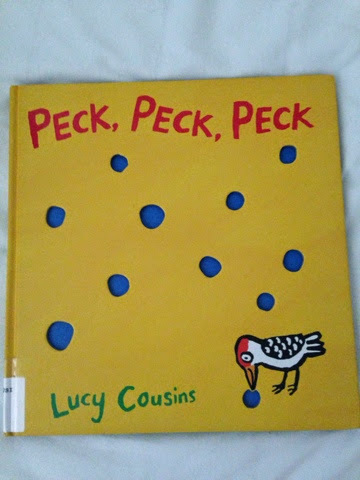 Little Lipstick's current favorite book is Peck Peck Peck by Lucy Cousins. This book has, um, no real plot. It has potential. In fact on first reading you are struck by the sweet daddy woodpecker teaching his son how to peck. They have some guided practice and then the daddy releases responsibility so the son can go off independently and peck whatever he would like. The young woodpecker takes the challenge to heart, flies into a nearby house and pecks everything in sight. The washing machine, a book of Jane Erye, a tennis racket, clothing, kitchen appliances, even the toilet. On first reading you are sure he is in for it. At any moment this daring little bird is going to be run out of the house by the humans, growled at by a dog, or at least chased when he tries to peck a napping cat. *spoiler alert* no such climax takes place. Proud of his hard work the young bird returns to his nest where his father tells him how proud he is of all his pecking, kisses his head and sends him to bed. Sweet ending but I'm personally left wondering about the poor family whose family portraits have been destroyed. And what exactly the publisher was thinking. Then, on our 37th reading I found myself doing what I always do- thinking like a teacher. This book would be a fabulous Vocab builder, especially for your ESOL populations. 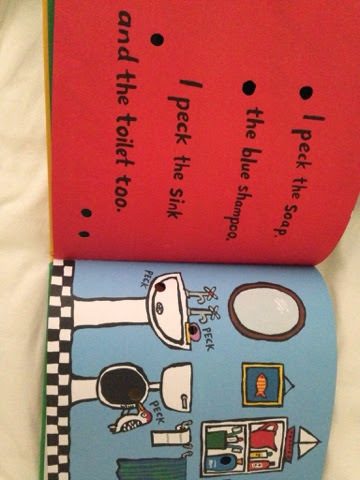 Since it is really just a long list of common vocabulary with somewhat of a narrative twist it could be a very engaging book for a younger crowd that needs practice with words. While it doesn't include any school vocabulary it is begging for your class to write a sequel- when the little woodpecker comes to school. It would be a great way to list all the school tools in your classroom with words and pictures (also teaching concepts of print). As a class you could re-read it over and over again so your students could put the words into long term memory. It would be rote practice without it being boring practice. 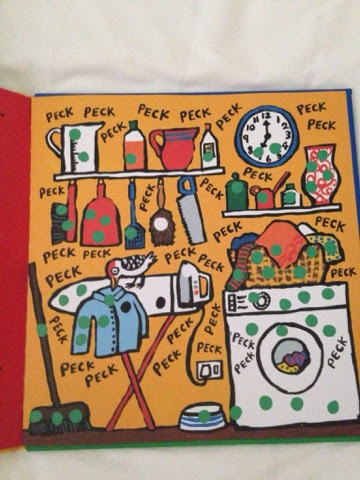 How engaged would a kinder class be at the idea of a bird pecking their room? It's just too silly (which means right up their alley). Now I want to make some lesson plans and go teach! Ah, maternity leave- maybe I'll just cuddle Baby Lipstick instead. and see how it plays out. It's hopeful that this research now exists and can be a part of the education debate. I've certainly seen this to hold true. When teachers become focused on test scores as their only goal the teaching can suffer. I saw this years ago with a particular kindergarten reading assessment. Teachers who focused on the assessment had kids who scored extremely well on that particular assessment, but they didn't maintain their scores into first grade. The teachers with lower scores had students who became better readers in the long run. (I don't have the numbers or data to back that up, just my personal observations from in the trenches). When we teach to the test the test becomes the end goal. We forget to think beyond it and don't teach the skills the students will need for the next steps. Lately when I've been missing the classroom I find myself getting in over my head with projects for Little Lipstick. 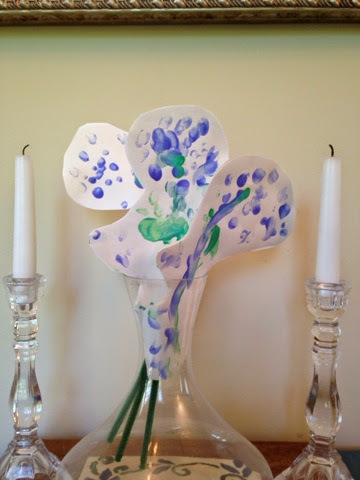 Once the paint drived I mounted them on cardstock, taped pipe cleaners to them and we had a beautiful bouquet! 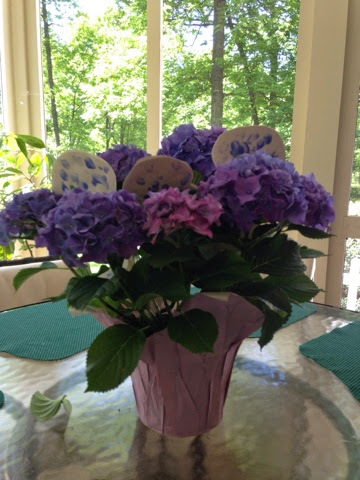 They fit in nicely with a hydrangea plant from Trader Joes. 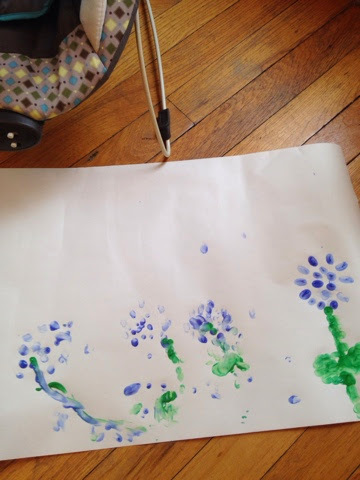 Of course baby got fussy and while I was changing her diaper the two year old decided that if finger painting was that much fun foot painting would be even better. 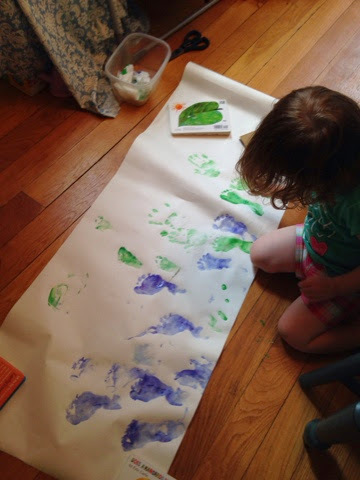 There were little blue and green footprints on our floor. I had to pick her up and carry her to the tub. There is still green paint in our bathroom. Last night Baby Lipstick and I headed out to our county's annual Teacher Research Conference. Halfway through after standing in the back of the room and constantly rocking (my calves were exhausted later that night!) I thought maybe bringing a baby to a conference was a bad idea. Maybe I overshot this one, but by then it was too late to turn around. Plus I was already getting my teacher research high so it was hard to just walk away. I love teacher research. 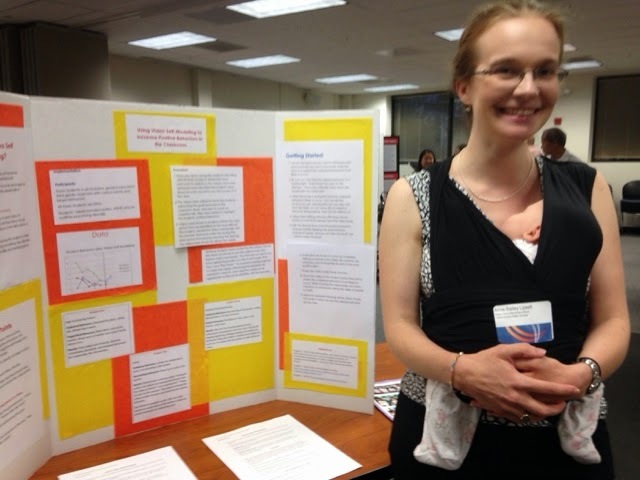 My county has an organized research program every year that brings together groups of teachers who want to look deeply into their practice. I did this for years at The Think Tank (my former school) and always found it made a huge impact on my practice. It changed how I looked at teaching- taking it from a formula of delivery to a practice of inquiry where everything done in the classroom can be examined, studied, tweaked, and reflected upon. This year we started the program at my new school and I must admit that our monthly meetings were often my motivation to get through tough weeks. They embodied what I love most about the profession- critically thinking about how to do the best that we can for kids despite whatever roadblocks are in our way. We came together, shared what we were working on, listened to one another problem solve and reflect together and always left with more energy than we came with. There is something empowering as a teacher to be able to look at your practice and say "what if?" in order to get better results. When you are motivated to constantly change your practice to do what's best for kids is when true teaching happens. It's reflective and thoughtful- and data driven for the right reasons. The difference between teacher research and scholarly research is that we are not held to the strict structure of scholarly practice. We can't be- it wouldn't be ethical. If we found something wasn't working we wouldn't keep doing it to get our data- we'd change to do what's best for our students. It's action research, which of course can't be considered in the same field as more scholarly qualitative research but it still has a place in the field. 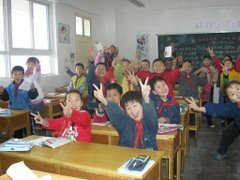 Last Friday I popped by school to say hello. Walking down the hall with new baby Lipstick strapped to my chest I ran into a few third grade students. "Mrs Lipstick!" One shrieked, "Cute baby! Umm, yesterday was Thursday and you forgot lunch bunch!" She crossed her arms and tipped her head to the side as though she was the teacher and I was a delinquent student. Yes. Maternity leave, new baby, forget all that. Clearly my priorities are out of order if I "forgot" lunch bunch. Glad to be missed? There is a measles outbreak in my area. The local news is publishing a list of public places that were contaminated and warning people who visited those spots on certain days and times to be aware that they could have been exposed. With a newborn this is terrifying. Every mommy instinct in me wants to hide my baby inside to prevent any possible exposure to a sickness she's too young to be immune to. I also want to scream at the anti-vaccinators from the roof tops. "What is wrong with you? Why would you expose all of us to this? Why are you hiding behind faulty beliefs that go against science?" But the thing is, I kind of get where they are coming from. The same mommy instinct that makes me want to hide my child inside made me worried about vaccines. Worried in that way back mommy crazy place many of us work hard to ignore, but worried nonetheless. In each of us there is an understanding of reality and then there is mommy-worry. A friend of mine has twins with autism. She's read the studies, she knows, absolutely knows that vaccines do not cause autism. She gets that on a cognitive level. But she can't get past the suspicion that it did in her case. That until her babies had their shots they were fine. She knows this isn't true, but admits there is a tiny piece of her that still believes. I can't imagine the mourning a parent goes through when their typically developing child starts to appear to be not so typical. I can't imagine where my mind would take me if the child I loved wasn't the child I thought he was. I would want something to blame too. I would ask a million questions, look for connections between various events try to find an answer. I have a lot of empathy for these parents struggling with the acceptance piece and looking for answers. I also can empathize with the parents scared to vaccinate their children. For a few years there we heard a lot of people getting press in the anti-vaccine movement and didn't hear much in the pro vaccine camp. 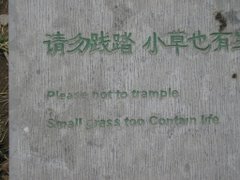 It made everyone stop and think- what's safe? As a parent it is your job to protect your child. No one should do anything blindly for their child- they should make informed decisions. So I get it. I really do. It's scary trusting that the doctors are injecting something safe into your child when you can't fully understand what's in it. But what I don't understand, what I can't empathize with is the parents who continue the anti-vaccine fight. Ask questions, yes. Do your research. Are these vaccines ok? Talk to your doctor about your concerns. But then you need to listen to your doctor and listen to the research. Protecting your child doesn't mean fighting the world and going against the status quo. It means doing your research and being open to answers. When your doctor tells you the vaccines are safe, listen. Ask why they are safe, ask for research, for numbers, for statistics. Question but when the doctor gives you an answer listen openly. You owe it to your child, and to mine. My hope is that the anti-vaccine movement is dying out. The more press about the importance of vaccines will help more people abandon the autism worries. Meanwhile I hope doctors are doing everything they can to listen to parents' fears openly and then dispell them respectfully so that even the most anxious parent will vaccinate their child.